The dsp.FIRRateConverter System object™ performs sampling rate conversion by a rational factor on a vector or matrix input. The FIR rate convertor cascades an interpolator with a decimator. The interpolator upsamples the input by the upsampling factor, L, followed by a lowpass FIR filter. The FIR filter acts both as an anti-imaging filter and an anti-aliasing filter prior to decimation. The decimator downsamples the output of upsampling and FIR filtering by the downsampling factor M. You must use upsampling and downsampling factors that are relatively prime, or coprime. 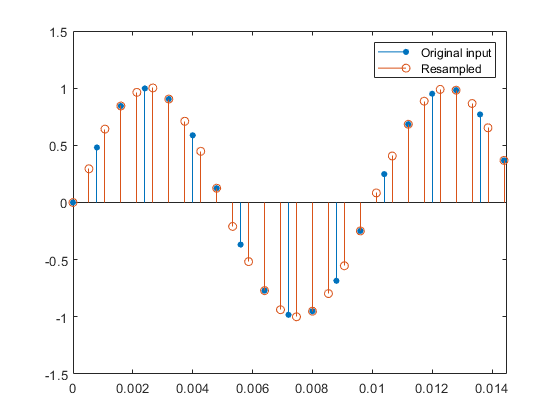 The resulting discrete-time signal has a sampling rate L/M times the original sampling rate. Create the dsp.FIRRateConverter object and set its properties. firrc = dsp.FIRRateConverter returns a FIR sample rate converter, firrc, that resamples an input signal at a rate 3/2 times the original sampling rate. firrc = dsp.FIRRateConverter(L,M,NUM) returns an FIR sample rate converter, firrc, with the InterpolationFactor property set to L, the DecimationFactor property set to M, and the Numerator property set to NUM. firrc = dsp.FIRRateConverter(___,Name,Value) returns an FIR sample rate converter, with additional properties specified by one or more Name,Value pair arguments. Example: firrc = dsp.FIRRateConverter('FullPrecisionOverride','false') enables the fixed-point data types to be controlled through the individual fixed-point property settings. Interpolation factor, specified as a positive integer. Decimation factor, specified as a positive integer. Specify the FIR filter coefficients in powers of z-1. The length of filter coefficients must exceed the interpolation factor. Use a lowpass with normalized cutoff frequency no greater than min(1/InterpolationFactor, 1/DecimationFactor). All initial filter states are zero. Specify the rounding method as one of | Ceiling | Convergent | Floor | Nearest | Round | Simplest | Zero |. Specify the overflow action as one of | Wrap | Saturate |. Specify the filter coefficient fixed-point data type as one of | Same word length as input | Custom |. Specify the filter coefficient fixed-point type as a numerictype object with a Signedness of Auto. This property applies only when the CoefficientsDataType property is Custom. Specify the product fixed-point data type as one of | Full precision | Same as input | Custom |. This property applies only when the ProductDataType property is Custom. Specify the accumulator fixed-point data type as one of | Full precision | Same as product | Same as input | Custom |. This property applies only when the AccumulatorDataType property is Custom. Specify the output fixed-point data type as one of | Same as accumulator | Same as product | Same as input | Custom |. This property applies only when the OutputDataType property is Custom. y = firrc(x) resamples the input x and returns the resampled signal y. Data input, specified as a column vector or a matrix. The number of input rows must be a multiple of the decimation factor. An M-by-N matrix input is treated as N independent channels. Resampled output, returned as a column vector or a matrix. The number of rows in the output signal is given by MI/D, where M is the number of input rows, I is the interpolation factor, and D is the decimation factor. This example shows how to resample a 100 Hz sine wave signal by a factor of 3:2. Create a FIR rate converter filter. The default interpolation factor is 3 and decimation factor is 2. Plot the original and resampled signals. This example shows how to resample and play an audio signal from 48 kHz to 32 kHz on a Windows® platform. Create an FIRRateConverter System object with interpolation factor = 2, decimation factor = 3. Default FIR filter coefficients define a lowpass filter with normalized cutoff frequency of 1/3. This object implements the algorithm, inputs, and outputs described on the FIR Rate Conversion block reference page. The object properties correspond to the block parameters.